Who do you trust most? Those who talk at you? Or those who listen to and respond to your needs? In this interactive workshop, certified coach and improvisation consultant, Caitlin Drago, will help you to refine your listening skills. This will allow you to have meaningful, productive exchanges with clients, improving trust and increasing sales. 1. What does listening have to do with trust? 3. How to improve your ability to actively listen to your clients, even under pressure. 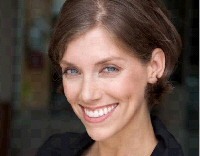 Caitlin Drago is the owner of Inspire Improv and Coaching. She uses her backgrounds in both leadership coaching and improvisational theatre to help teams to work together in a more productive, creative and collaborative way.